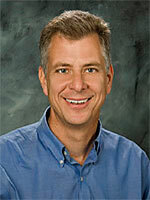 Scott Grafton received BA's in Mathematics and Psychobiology from the University of California at Santa Cruz and his MD degree from the University of Southern California. He completed a Neurology residency at the University of Washington and a residency in Nuclear Medicine at UCLA. He was a research fellow in Neuroimaging at UCLA, where he developed methods for mapping human brain activity using positron emission tomography. His first tenure track position was at University of Southern California. He subsequently held positions at Emory University and Dartmouth College, where he was director of the Brain Imaging Center. He joined the UCSB faculty in 2006 and is director of the UCSB Imaging Center. Professor Grafton is the author of more than 115 publications. He is action editor for the journal NeuroImage and is on the editorial board of Annals of Neurology, Clinical Neurophysiology, Experimental Brain Research and the Journal of Cognitive Neuroscience. He is a member of the Board of Scientific Counselors of the NIH intramural branch, and has served as an NIH study section member.